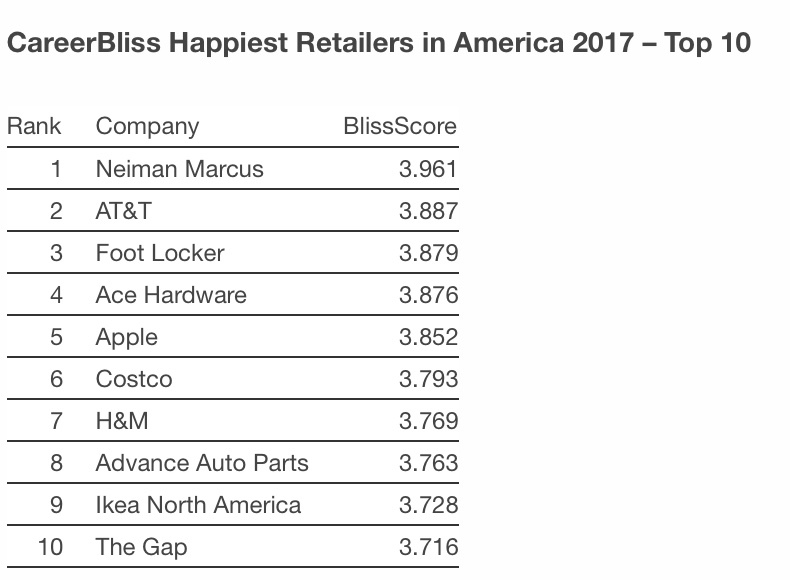 CareerBliss, the leading career community with over three million open jobs, has released new data identifying the “CareerBliss Happiest Retail Employers for 2017.” Apple ranks fifth on the list, preceded by Neiman Marcus, AT&T, Foot Locker, and Ace Hardware. Trailing Apple in the top 10 are Costco, H&M, Advance Auto Parts, Ikea North America, and The Gap. CareerBliss analyzed the key factors that affect employee happiness. Those factors are: work-life balance, senior management, compensation, benefits, job security, employee tasks, company culture and work environment. The results are generated from CareerBliss.com review submissions and serve to provide insight into employers. Employees rank factors on a scale of 1-5. Apple had a “BlissScore” of 3.852. All of the retailers in the top 10 share common traits that drive high BlissScores, including positive relationships with coworkers, room for career growth, support from senior management, and a positive company culture, says Heidi Golledge, “chief happiness officer and co-founder of CareerBliss.